Atlantic South Region: Dog Days of Pickleball in Cherokee County! the pool before heading home for the day. Pat Dunn, John Pyle, Bill Whatley, Steve Everett and David Barron enjoying the N. Georgia Courts. David Barron recently moved to Cherokee County from Phoenix, Arizona and joined our group today bringing along his daughter, Jenn Barron, and introducing her to the game. Also on the courts today was Jessie Romito, Sports Director for the Summit at ATPP in Marietta, GA joining us to learn more about the game. After playing one game, she understood the addiction most people have to the game! 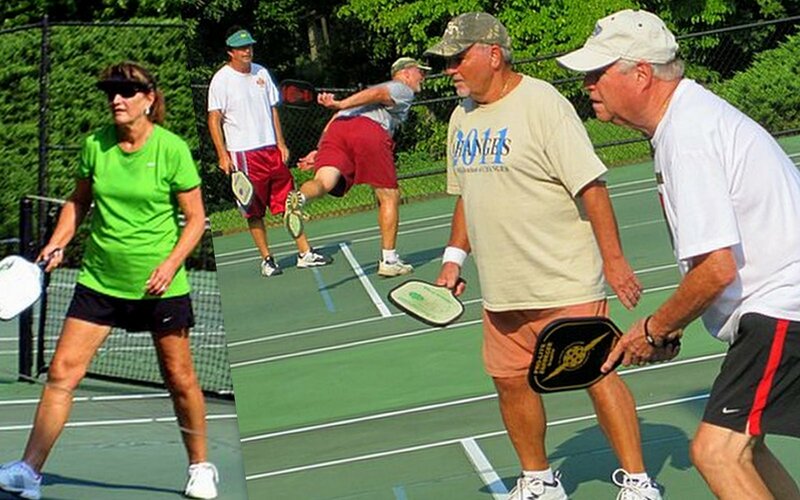 Jessie hopes to introduce PickleBall to The Summit with an upcoming lecture and demonstration by Tom Earley and a group from the North Georgia Pickleball Club. joined us to play. Quite a week for PB in Cherokee County!